In The Dirt Bike Detective, author Douglas L. Hoover combines outstanding characterization and a vivid narrative to create a poignant and delightful young adult mystery novel. Narrated by Oliver Teller, a sweet-natured 12-year-old who fights against self-consciousness because of a large birthmark on his face, the story begins on the first day of school at Raven Ridge Academy, a castle-like mansion rumored to be haunted. While waiting for his best friend, Gio, a boy born with one and a half legs who relies on a prosthetic, Oliver meets Chase Sullivan, a new student and self-declared paranormal activity detective. Strange events occur at the school: power outages plunge it into darkness; voices echo; ghostlike figures appear; Oliver, Chase and Gio overhear faculty members’ heated arguments and accusations of suspicious behavior; and a teacher disappears at the end of the day – all while the school prepares for a visit from the president of the United States. Convinced paranormal activity is stirring, Chase enlists Oliver, Gio, the beautiful Jaclyn (on whom Oliver has a crush, which he describes in hilarious, lavish love tones) and the likable know-it-all Eduard to investigate. The team uncovers plots more perilous than spirit visitations and alien abductions, and they’re led into genuine danger. 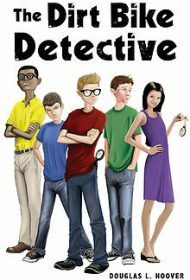 Hoover crafts a great thrill ride, and it’s a joy to witness his feisty, smart, humorous young investigators make their deductions and act on their hunches. Yet, Hoover insists that his YA mystery be more than a fun adventure: He imbues pathos and realism – single mothers coping with loneliness; adults committing unconscionable acts of disregard; those with physical differences being ostracized and bullied – which, in turn, adds depth, maturity and edginess to the tale’s wholesomeness. With skillfully paced suspense, prose that clearly details scene and character (although some minor copyediting issues remain in need of attention), a compelling portrait of friendship and loyalty and an ending that is sequel-ready, Hoover’s debut is bound to please YA readers.